Use these delicious mix-and-match healthy recipes to create your perfect diet plan—one that's free of calorie-counting and hassle. Start with these satisfying base meals, created by Cynthia Sass, R.D., then swap in your favorite ingredients to change things up. All you need to do is satisfy each of five categories of nutrients at every meal. We've given enough substitutions for a one week of meals, but don't stop there—keep going all month long. Pair this with our Bikini Body Countdown workout and you'll be beach-ready in no time! Love this healthy diet plan? It's adapted from Cynthia Sass's book, S.A.S.S! Yourself Slim, available at amazon.com. Heat a skillet over medium. In a small bowl, whisk egg or egg whites and soak bread in mixture. Transfer to the skillet and pour excess egg over the top. Cook until golden brown, flip and cook until second side is browned. Transfer to plate, top with peaches, pecans, and spices. Add cracked black pepper to the egg and scramble over medium-high heat. Toast the bread and top with 1 tablespoon pesto (omit the pecans). Serve with a side of sliced peaches dusted with cinnamon, nutmeg, and cloves. Replace the bread with half a toasted whole-grain English muffin. Top with an egg, cooked sunny-side up. Serve with a side of sliced peaches topped with cinnamon, nutmeg, cloves, and chopped pecans. Trade the egg for one cup of skim milk. Replace the toast with ¬º cup dry, rolled oats, and the pecans with 2 tablespoons pecan butter. In a blender whip together the milk, oats, pecan butter, peach (remove pit and skin), spices, and a handful of ice. Pour into a glass. Cook French toast as in base recipe. Replace the pecans with 2 tablespoons almond butter and the peach with 1 cup frozen, pitted cherries. Heat cherries in the microwave or in a saucepan until warm and juicy. Fold the spices into the cherries. Slather the cooked French toast with the almond butter and top with cherries. Hard-boil the egg. Spread the toasted bread with 1/4 of a ripe Hass avocado (omit the pecans) and top with sliced egg. Serve with a side of the sliced peaches dusted with cinnamon, nutmeg, and cloves. Trade the egg for 1/4 cup nonfat ricotta cheese. Toast the bread, spread with ricotta cheese, season with spices, and top with the peach slices and pecans. In a small bowl, toss tomatoes, quinoa, chicken, and olives with lemon juice and garlic. Spoon mixture evenly into Romaine leaves and serve. Replace the Romaine with 1 cup mixed greens. Whisk lemon juice and garlic with 1 tablespoon balsamic vinegar and toss with the greens and tomato. Pile on a plate and top with quinoa, chicken, and olives. Replace the Romaine with 3/4 cup sliced cucumber and 1/2 cup minced red onion. Trade the chicken for 1/4 cup cooked lentils and swap the olives for 2 tablespoons sliced walnuts. Whisk lemon juice and garlic with 1 tablespoon balsamic vinegar. Spoon quinoa onto center of plate and top with tomato, cucumber, and onion. Sprinkle lentils and walnuts over the top and drizzle with dressing. Replace quinoa with 1/2 cup cooked, chilled wild rice; the chicken breast for 3 ounces cooked wild salmon; and the whole tomato with 1/4 cup grape tomatoes, sliced in half, and 3/4 cup minced red onion. Toss the wild rice, salmon, olives, and red onion with lemon juice, garlic, and 1 tablespoon balsamic vinegar. Fill Romaine leaves with salmon mixture and top with sliced grape tomatoes. Replace Romaine with 1 cup broccoli florets, trade olives for 1 tablespoon extra virgin olive oil, and swap quinoa with 1/2 cup cooked whole-grain penne. In a pan over medium heat, sautéed broccoli and tomatoes in olive oil with garlic. Toss sautéed veggies with penne and chicken, and drizzle with lemon juice. Replace Romaine with 1/3 cup each minced green bell pepper, minced red onion, and shredded carrots, and swap quinoa with 1/2 cup cooked, chilled whole grain penne. Whisk lemon juice and garlic with 1 tablespoon balsamic vinegar and add 1/2 teaspoon salt-free Italian herb seasoning. Toss dressing with veggies, tomato, pasta, chicken, and olives. Refrigerate and serve cold. Replace olives with 1 tablespoon basil pesto and trade chicken for 1/2 cup chickpeas. Toss pesto, chickpeas, and quinoa with the garlic. Fill Romaine leaves evenly with mixture, top with diced tomato and a drizzle of lemon juice. In a bowl, mix chopped apple with lemon juice and cinnamon and microwave on high for 3 to 5 minutes until soft and juicy. Top with oats and walnuts; serve with a glass of milk. Replace the walnuts with 2 tablespoons walnut butter. In a blender, mix together the apple (remove core, seeds, and skin), oats, milk, walnut butter, spices (omit lemon juice), and a handful of ice. Serve in a glass. Replace oats with 1 slice toasted 100 percent whole grain bread and trade milk for 1/4 cup nonfat organic ricotta cheese. Top toast with ricotta, apple, and walnuts, then sprinkle with cinnamon (omit lemon juice). Replace the oats with 1 slice 100-percentwhole grain bread and trade the milk for 1 ounce smoked Gouda. In a small bowl, toss apple with lemon juice and cinnamon and microwave on high for 3 to 5 minutes until soft and juicy. Top the bread with thin slices of Gouda, the warmed apple, and walnuts. Replace the apple with a pear and trade walnuts for sliced almonds. In a small bowl, toss the chopped pear with lemon juice and add cinnamon; microwave on high for 3 to 5 minutes until soft and juicy. 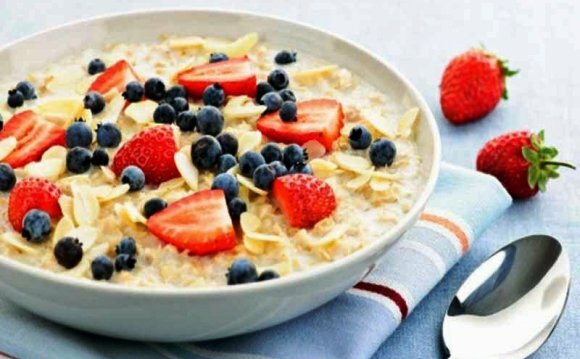 Top with oats and almonds; serve with a glass of milk. Preheat the oven to 350°. Replace the apple with 1 cup sliced strawberries, trade the milk for 1/2 cup nonfat cottage cheese. Toast the oats on a baking pan in the oven for 3 to 5 minutes until golden brown. Fold the cinnamon into the cottage cheese (omit lemon juice), stir in strawberries, and top with walnuts and the toasted oats. ABC has saved the best for last when Dr. Phil's weight loss challenger, Monika, gets the plastic surgery of her dreams and Marylinda, a former California beauty, undergoes the most 'Extreme' makeover in the show's history.